A judge has refused to reverse his order that former Trump campaign chief be transferred to a different facility. A federal judge shot down former Trump campaign honcho Paul Manafort's request to stay at a rural Virginia jail where prosecutors say he had boasted about VIP treatment — including his own telephone and laptop and figuring out a way to get emails sent. Judge T.S. 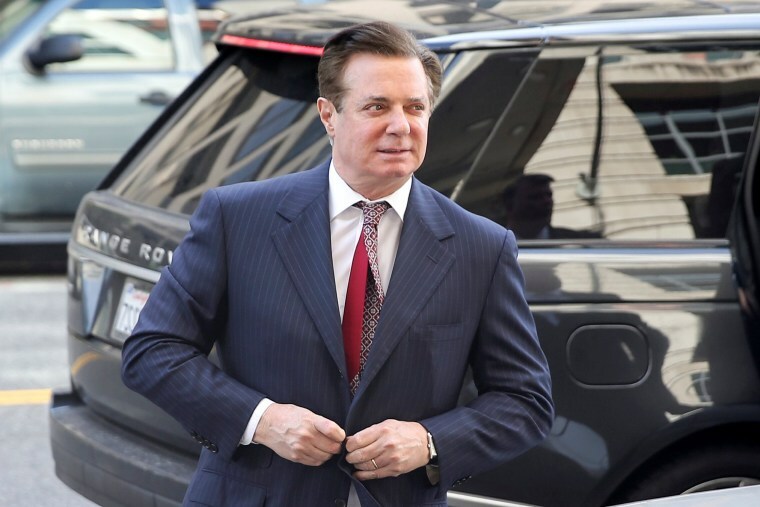 Ellis of the Eastern District of Virginia declined Wednesday to reverse the order he issued the day earlier directing U.S. marshals to transfer Manafort from the Northern Neck Regional Jail in Warsaw to a detention center in Alexandria, Virginia. Ellis expressed annoyance, noting that he ordered the transfer after Manafort's legal team complained that Northern Neck's remote location and safety restrictions were interfering with his ability to prepare for trial. "It is surprising and confusing when counsel identifies a problem and then opposes the most logical solution to that problem," the judge wrote. Manafort, whose bail was revoked for alleged witness tampering, is awaiting two trials — one in Virginia and one in Washington — on a slew of charges tied to his business dealings and Ukraine lobbying work. The charges were brought by special counsel Robert Mueller, who uncovered the alleged crimes while investigating Russian interference in the 2016 presidential election and possible collusion by the Trump campaign. In a filing on Wednesday opposing Manafort's bid to put his Virginia trial on hold until after his Washington trial, Mueller's team pushed back on the argument that the conditions of his detention made it difficult for him to prep. In fact, they wrote, Manafort was living in relative luxury compared to other inmates at Northern Neck, where he is in the same housing unit where former NFL player Michael Vick once did time. "Among the unique privileges Manafort enjoys at the jail are a private, self-contained living unit, which is larger than other inmates’ units, his own bathroom and shower facility, his own personal telephone, and his own workspace to prepare for trial," the prosecutors wrote. "Manafort is also not required to wear a prison uniform. On the monitored prison phone calls, Manafort has mentioned that he is being treated like a 'VIP.'" They said he has had more than 100 calls with his attorneys and 200 calls with other people and is allowed to use his personal laptop to review legal materials. "Although the jail does not allow prisoners to send or receive emails, Manafort appears to have developed a workaround," prosecutors added. "Manafort has revealed on the monitored phone calls that in order to exchange emails, he reads and composes emails on a second laptop that is shuttled in and out of the facility by his team. When the team takes the laptop from the jail, it reconnects to the internet and Manafort’s emails are transmitted." In an interview with NBC News last month, the superintendent of Northern Neck said that while Manafort was assigned to a housing unit listed as VIP-1, "there's no special privileges for him." "All that is is a name and number," Superintendent Ted Hull said. "It's a small, fully functional, self-contained cell unit for high-profile inmates." Hull could not immediately be reached for comment, and Manafort's attorney also did not immediately respond to a request from NBC News. Manafort has pleaded not guilty in both criminal cases.